I wanted to share a little devotional that I gave at our church recently. 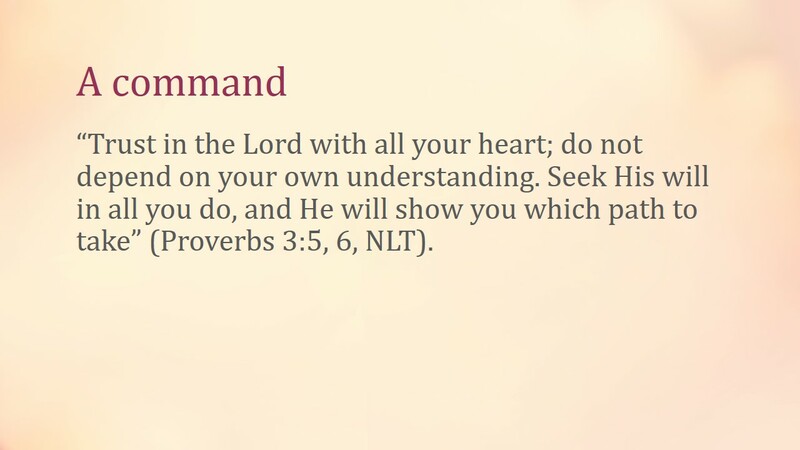 It is something that the Lord has been teaching me, and I hope it is a blessing to you as well. 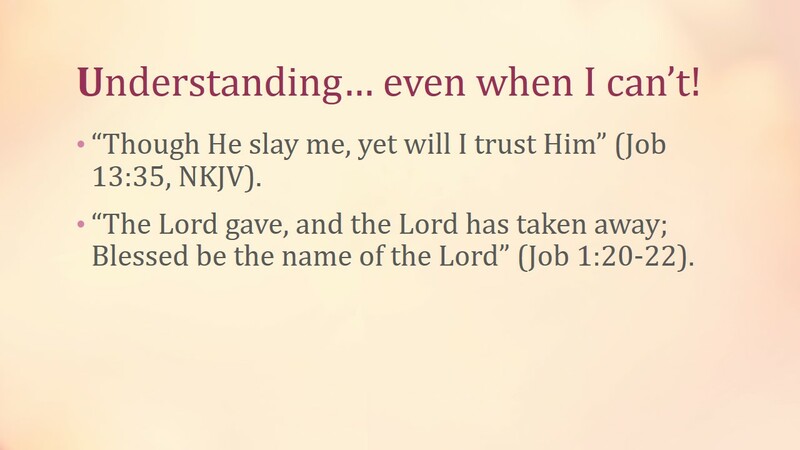 When God says, “Trust in Me…” it’s not just a suggestion. He doesn’t say, ”If you WANT to trust Me…” He TELLS us to trust. And really, it’s not so much a COMMAND as it is a PLEA. 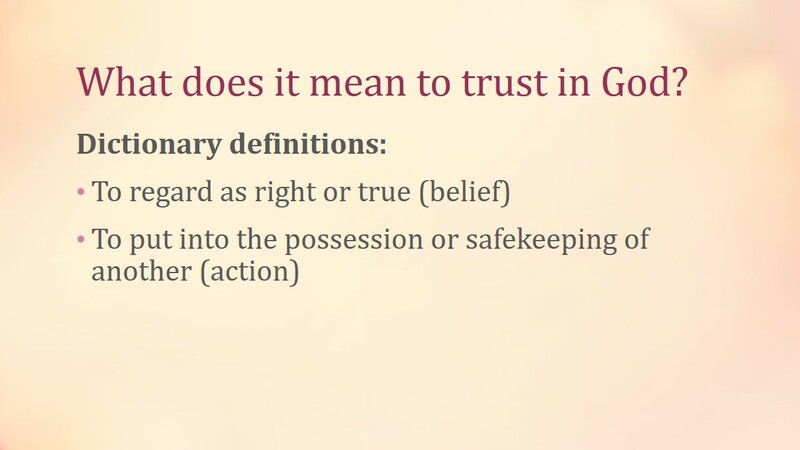 Ok, so God really wants us to trust Him, but what does that really mean? I figured that a good place find the meaning of the word trust would be in a dictionary. I was so amazed by the profoundness of the two simple definitions. 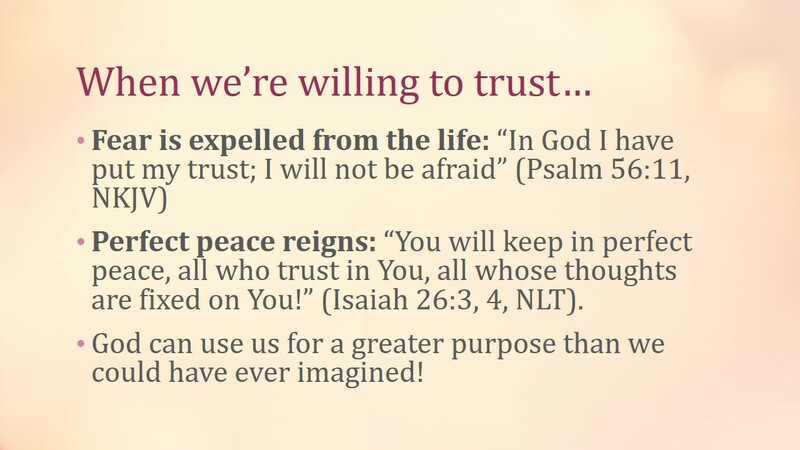 Trust is not JUST a belief or Christian catch-phrase (“Lord I trust you). Trust involves both the BELIEF that God will keep His Word, and also the ACTION of placing one’s whole life in His care. 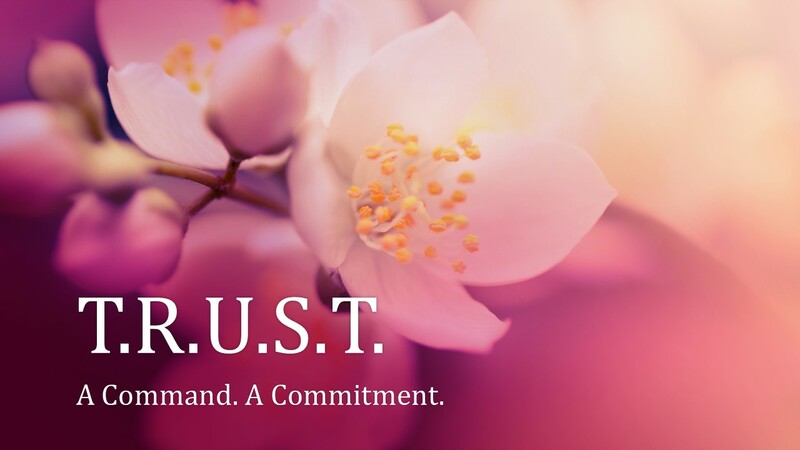 To make this easier to remember I came up with a little acronym for TRUST…. T is for Turning over every aspect of my life to God. This really goes back to the definition, “Putting into the possession or safekeeping of another.” Are you willing to put your life into the possession and safekeeping of God? R is for Realizing that God already has a perfect plan for me. The way God has led me in my school decisions has showed me the truth of these promises! Sometimes I was so set in my ways that I had to go in a certain direction, and then He would firmly close that door—right in my face! But the doors that He has opened instead have turned out to be far better than the ones I was pursuing. He was simply waiting for me to trust Him. 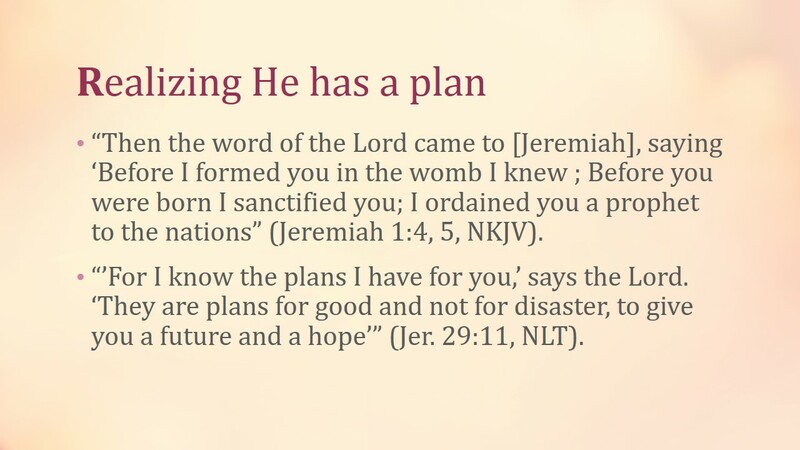 Are you willing to trust God’s promise that He has “plans for good” in store for you? U is for Understanding that I may not always understand! Wow, those are powerful, faith-filled words. Are we willing to trust God, even to the point of death? Are we willing to say, like Job did, “The Lord gave, and the Lord has taken away; Blessed be the name of the Lord”? S is for Seeking God’s will every step of the way. One thing the Lord has been teaching me is to actively pursue His will. It would be a mistake to say, “Lord, I trust you to show me your plan for my life,” and then sit back and do nothing, waiting for Him to somehow show you His plan. Remember the dictionary definitions of TRUST? It’s not just about belief or a catch-phrase. It also involves action. 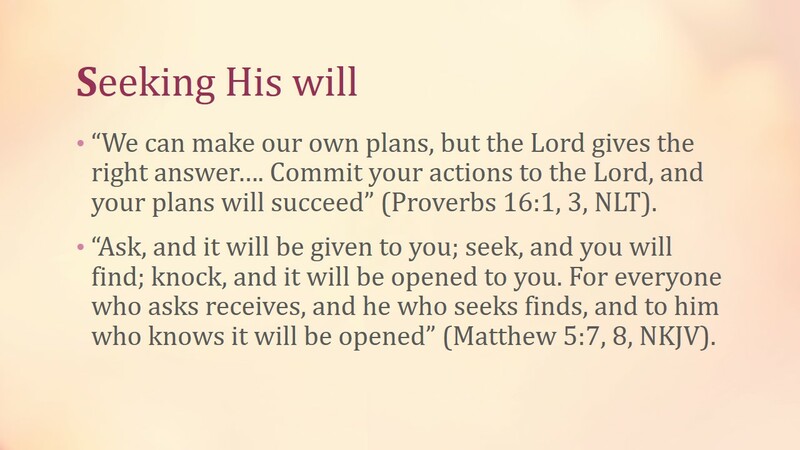 Are you willing to diligently “ask, seek, and knock” to know God’s will for your life? Lastly, T is for Thanking God when things don’t turn out as expected. This is really the most important part of TRUST. When I’ve done my part and earnestly sought God’s direction, but things still don’t turn out like I might have hoped, it’s can be a temptation to worry. But if I am experiencing worry and anxiety, then I know that I am not truly trusting. I will only experience the “peace that passes understanding” when I’m willing to thank God for leading—wherever He may have led. Are you willing to thank God and trust Him, even when outcome isn’t what you wanted? You see, God can do great things with us when we’re willing to trust Him. He’ll expel fear, as promised by the words of David. 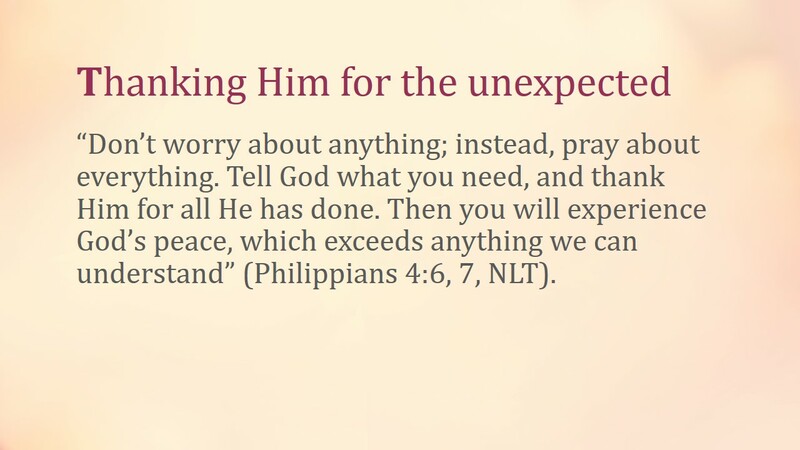 He’ll give us His peace, as promised through the words of Isaiah. And He’ll use us in ways we could never have imagined. Don’t you see now why He would plead with you to trust Him? This is a wonderful devotion. May I share it with my friends at our next brunch? Hi Lora! Please feel free! I hope your friends find it inspirational! 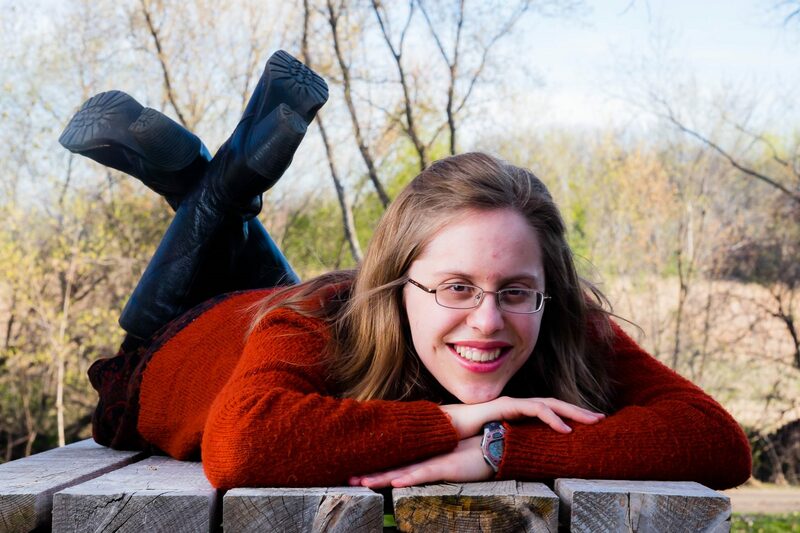 Hi Sarah, thank you for the write-up. 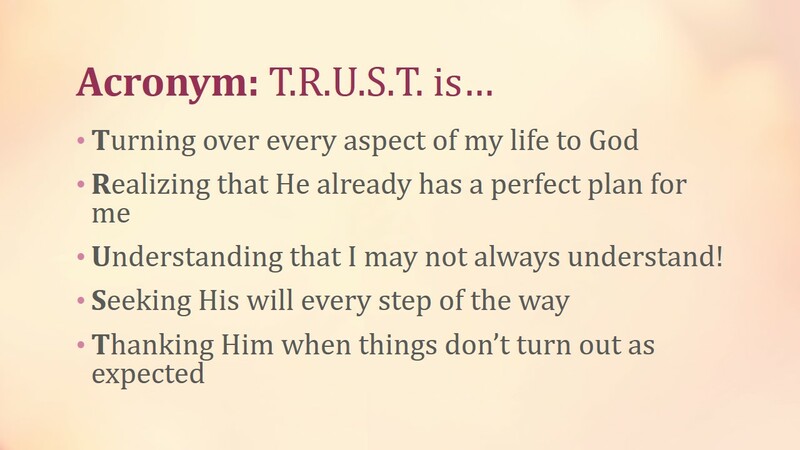 I wanted to know if it would be fine for me to share the TRUST acronym with my friends? Thank you for this powerful reminder! This has helped me tremendously. I will implement this devotion with the children in my after school program. You are more than welcome! I am so happy!